The winners of the HPS Schönox Worst Subfloor Contest™ were announced during a ceremony at The International Surfaces Event (TISE) in Las Vegas. 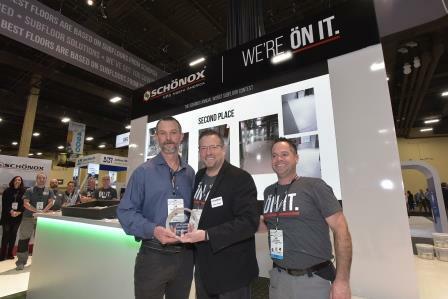 HPS Schönox’s annual Worst Subfloor Contest seeks to answer the question, “What lies beneath?” Many installers face nightmare scenarios when they start a new project. 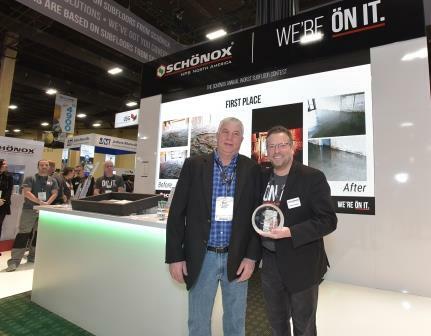 They choose to partner with Schönox materials to tackle those extreme subflooring challenges. They are encouraged to take photos during the process and submit these photos along with description of Schönox products. HPS Schönox asked three well-known people in the industry to serve as judges for the contest entries. The judges included Kimberly Oderkirk, Executive Vice President of The Flooring Contractor Association; Dean Thompson, President of Resilient Floor Covering Institute; and Peter Craig, Concrete Floor Specialist and Consultant with Concrete Construction. All identifying information was removed from the entries and only project photos and notes were available, so the judges could remain impartial. 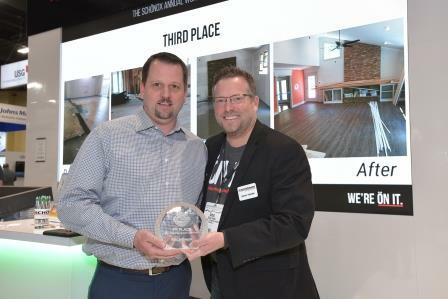 The judges were asked to evaluate the projects based on the severity of the original subfloor’s condition, the skill and attention to detail taken in executing the project, and the quality of the finished subfloor. Iowa Wall Sawing won first prize with a renovation of a room in a 100-year-old building. “The floor was in seriously bad shape,” said Jamie Bonazza. “My first onsite visit I was unsure if we could do anything. The subfloor was completely breaking and crumbling.” The team used Schönox US on the 2,200 sq. ft. space. The customer wanted to keep the floor an industrial look so after coating they sealed the floor. Floorz Denver took second place with a careful restoration of an oncology level at a hospital. “We could not make any noise to remove the old adhesives,” said Kurt Bowers. “The hospital was very happy that we could proceed without noise of traditional full removal.” A combination of Schönox products were used including Schönox VD, AST, and SL. They primed with Schönox SHP, leveled with AP and skimmed with APF. Tim Hogan’s Carpet – Lakeland gained third place with their repair on a multilevel home. They worked to cover existing plywood and concrete and trenching areas. Michael Barney commented, “We had a mess.” They repaired some of the holes in the slab with Schönox VD, RR and SL. Then primed the floor with Schönox VD and poured US. They did some final patching with Schönox SL before installing flooring.